Graduates: or…whatever can one do with a degree in ART? Since our first senior class in 1964 we have graduated over 500 majors in Visual Arts, many of whom have gone on to earn graduate degrees in a variety of fields. Since 2006 our graduates have earned advanced degrees from, or are enrolled in graduate programs at institutions such as Goddard College, Savannah College of Art & Design, Pratt Institute, San Francisco Art Institute, Maryland Institute College of Art, The School of the Art Institute of Chicago, Rochester Institute of Technology, Ohio University, University of Florida, Florida State University, University of South Florida, University of New Mexico, Southern Illinois University, University of Kentucky, Seattle University, Pennsylvania State University, George Mason University, University of Delaware, Virginia Commonwealth University, Claremont Graduate School, University of Indiana at Bloomington, Lesley University, Ball State University, Edinburgh College of Art (Scotland), and the Burren College of Art (Ireland). Our graduates ultimately travel down a great many career paths, many of them art-related. One can find our Visual Arts alumni/ae engaged in art-related fields as varied as university or college teaching, public school teaching, sculpture, photography, design, illustration, advertising, graphic design, printing, digital effects, computer graphics, ceramics, painting, architecture, art direction, fashion design, community-based arts, film production, exhibition design, communications, performance art, woodworking, calligraphy, urban planning, theatre set design, lighting design, gallery owning, landscape architecture, stained glass restoration, and arts management. 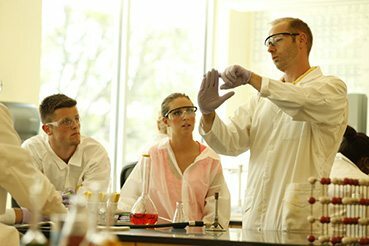 Not all of our majors elect to pursue art as a career, for we also have alumni/ae who have chosen professions in fields as varied as civil engineering, psychotherapy, banking, retail sales, financial analysis, antiques, online networking, computer programming, music, military intelligence, social work, massage therapy, occupational therapy, nursing, youth ministry, law, radiology, real estate, and the list goes on! Jason Adkins ’96 (MFA, Claremont Graduate University) has been exhibiting his paintings and sculptures with the Western Artists Group, based in Los Angeles. Grace-Anne Alfiero ’04 (MFA, Goddard) is currently President and CEO at Arts in Action in Philadelphia, a consulting firm for non-profit organizations. She was founder of Creative Clay in St. Petersburg, and served as its Executive Director until 2011. Joy Brown ’72 has exhibited her ceramic sculptures in one-person shows in Europe and Asia, and her work has been prominently featured in Ceramics Monthly. Joy is also co-founder and president of the Still Mountain Center, a nonprofit arts organization in Connecticut whose mission is to support, promote and celebrate artistic exchange between the United States and Asia. 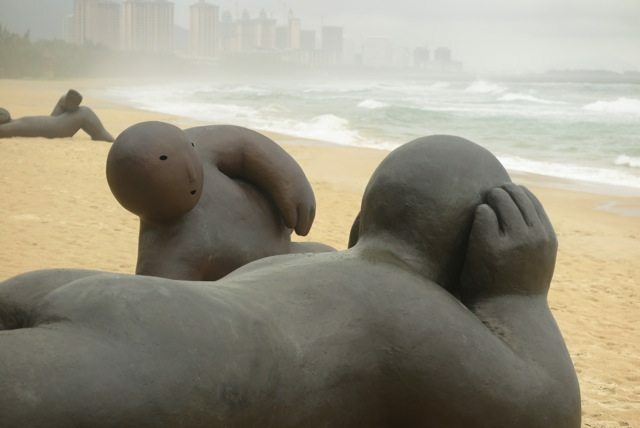 In 2017, nine of Brown’s large bronze figures were displayed on Broadway for a period of six months; 12 were also exhibited on the beach in Sanya, China (below). Pamela Callender PEL ’07 received her MFA in Interdisciplinary Arts from Goddard College, and she now is an art exhibitions curator for the Fogartyville Media and Arts Center in Sarasota, Florida, as well as for the Sarasota Peace Education Center. She also recently taught a course for us in Environmental Art. Jeffrey Carr ’74 is Exhibitions and Collections Manager of the Kennedy Museum of Art, at Ohio University. Denise Choppin ’74 (MFA, FSU) is a graphic designer and mixed-media artist in Tallahassee. Bede Clarke ’83 (MFA, University of Iowa) is Professor of Art at the University of Missouri at Columbia, teaching ceramics. Kevin Collins ’99 is a professional golf instructor at the IMG Academy in Bradenton. Neverne Covington ’77 is a painter, printmaker and book artist in St. Petersburg. Carolanne Currier ’69 has taken on a second career as a ceramic artist after spending many years as an investigator for the Food and Drug Administration (FDA). 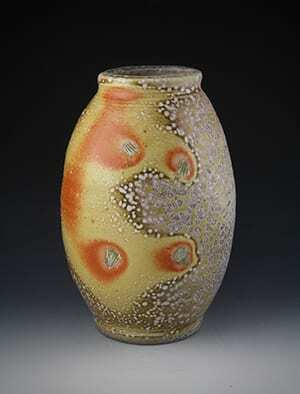 Susan DeMay ’77 (MS, Peabody/Vanderbilt, and MA, Tennessee Tech) is Senior Lecturer in ceramics at Vanderbilt University. For more of her current work see her personal website. Ben Dimmitt ’76 is a photographer who taught for years at the International Center of Photography in New York. He recently moved to Asheville, NC. Hope Donnelly ’02 is owner and Creative Director of 8-Count Productions in Tampa. 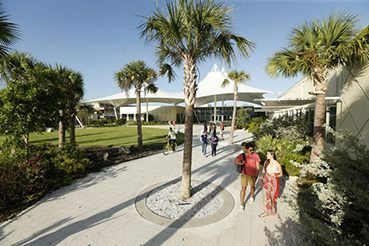 Dawn Regan Ellenburg ’86 has been the Creative Director at Eckerd College since 2004.
frje Echeverria ’66 (MFA, University of Arkansas) is Professor Emeritus of Painting at the University of Northern Iowa. Brad Ennis ’10 has been a photo assistant and production assistant at Annie Leibovitz studio in New York, and he now works full time as first assistant to photographer Billy Kidd. The late Paul Eppling ’71 was very well-known in the Tampa Bay area for his welded metal sculptures. May 8, 2014 was celebrated as Paul Eppling Day in St. Petersburg, a tribute to the remarkable work he made for the community. Matt Fisher ’98 (MFA, Claremont Graduate U) is an artist, writer, editor and web developer in Oakland, California. A recent work in collaboration with Finishing School, “We Will Show You Fear in a Handful of Dust” received national media attention in April, 2014. Zoe Friedman ’07 earned her MFA at the Maryland Institute College of Art. She works in photography, video, installations and finely cut paper. Zoe recently spent six months travelingaround the world on a Henry Walters Traveling Fellowship. John Freeman ’11 earned his MFA from the Burren College of Art in County Clare, Ireland. He now lives in Seattle, and has formed the collective “Occupy Space – Seattle,” an international sister project to Occupy Space, along with a growing number of Seattle based artists. Esther Rodriguez Fuldauer ’92 is a painter, and also a UX/UI designer in Blanes, Catalonia, Spain. Samantha Goresh ’03 earned her Masters in Photojournalism at the University of Ohio, and is a photographer with GateHouse Media Metro Unit in Boston. Ben Hamburger ’10 earned his MFA in Community Arts from the Maryland College Institute of Art. His thesis work at MICA explored the consequences of urban development in Baltimore; it was reviewed in the Baltimore press, and also featured in an interview on NPR. Kristin Harrison ’01 (MFA, UT Austin) has worked for years as a photographer, writer and editor for national publications including National Geographic Traveler, The Washington Post, Women’s Running Magazine and Where International. James Heaton ’88 is President and Creative Director of Tronvig Group, a branding firm based in Brooklyn. Tronvig Group has been listed by Clutch as a top advertising and marketing agency (2017). Stanton Hunter ’80 (MFA, University of Southern California) is Professor of Ceramics and Sculpture at Chaffey College in California. Harriett Huss ’73 is a painter, and founding member of the Melrose Bay Art Gallery near Gainesville, Florida. Stuart Hyatt ’97 is an interdisciplinary artist and musician. His cd package design for his own collaborative recording Clouds was one of five finalists for a Grammy Award in 2006. Stu earned a Masters of Architecture from Ball State University (in addition to his MFA from Indiana University), and he is a member of the M12 Studio, an innovative art and design collective that explores the aesthetics of rural cultures and landscapes. Founder of Team Records, he has recently has been engaged in a project of mapping sounds in Indianapolis. D. J. Jackson ’12is now an independent scientific illustrator. Martha Ensign Johnson ’75 is now retired from teaching printmaking at Westmont College in Santa Barbara, California. Blaze Birge Jones ’98 was a founding member of the Flynn Creek Circus in Mendocino County, California, committed to “pushing tradition to the edge.” Blaze is Creative Director of the circus, and specializes as a trapeze artist. The “Daring Jones Duo” won the Silver Medal at the International Circus Festival in Izhevsk, Russia, in March, 2014. Gabrielle Kan ’10 earned her MFA in ceramics at The School of the Art Institute of Chicago, and now teaches there. Jonathan Keeton ’80 is retired after a long and distinguished career as a pioneer in the visual effects industry, and he is now winning state and national awards with his watercolors. Andrea Jehn Kennedy ’95 is a photographer, designer and calligrapher living and working in Colorado. Betsy Lagana ’69 is a designer, printmaker, fabric artist and writer living in Bradenton, Florida. Mary Law ’69 (MFA, Alfred U) is Senior Lecturer in Ceramics at Contra Costa College, in California. Alexandra del Rio Loftus ’06 (MFA, Pratt Institute) is a photographer in the Los Angeles area. Andrew Long ’12 is the Ceramics Lab Technical Assistant at the State College of Florida in Venice, and also teaches in the Adult Enrichment Program at the Sarasota Technical Institute. Jessica Loving-Campos ’05 has been exhibiting her paintings frequently in her home state of Colorado. She and her husband also own a web/graphic design business there. Casey McDonough ’03 (MFA, RISD) has taught at Cedar Crest College and the University of Central Arkansas. Recently he gave a presentation at the 51st annual NCECA conference. Barbara McFadyen ’74 is a metalsmith and enamelist who has been designing jewelry in gold, silver, and enamel for over four decades. Barbara received her MFA in Metal Design at East Carolina University, and has exhibited with the American Crafts Council, the Smithsonian Institution, SNAG, and the Enamelist Society. Ian Meares ’00 earned his MFA in Studio Practice at Pennsylvania State University, and more recently and MFA in Critical & Curatorial Practice, at the University of California Irvine, Irvine California. Joe Melamed ’06 earned his MFA from the San Francisco Art Institute. Kelly Mills ’78 (MVA, Georgia State) is the Chair of the Visual Arts Department at Shorter University in Rome, Georgia. Ingram Ober ’98 (MFA, Claremont Graduate U) teaches sculpture and foundry at Palomar College in California. Erin O’Malley ’13 recently earned her MFA program in Studio Art at Mills College, concentrating in photography. Brandice Palmer ’97 earned her Master’s in Arts Administration at the Savannah College of Art and Design, and is now Manager of Media Relations at Stetson University College of Law. Beth Mueller ’77 has her own production company, featuring ceramics, clothing and paper products of her design. Kirk Palmer ’10 recently earned his MFA in painting from the Maryland Institute College of Art. Ruth Pettis ’78 completed a 10-year project rendering all 154 sonnets by Shakespeare in original calligraphy. Conor Pickett ’13 is Operations Manager at Clay by the Bay Pottery in San Francisco. Elaine Raybourn ’85 (Ph.D, University of New Mexico) is engaged in research with Sandia Labs, investigating the learning experience design of immersive transmedia ecosystems to support informal learning, ubiquitous computing, and the anthropology of next generation learners’ interactions with future learning technology. Watch her present in this 2015 TEDx talk. Tai Rogers ’01 earned his MFA in Ceramics at the University of Indiana at Bloomington, and is now the shop coordinator there in the School of Art & Design. Scott Ross ’97 earned his MFA in sculpture from Southern Illinois University at Edwardsville, and is now Assistant Professor of Art at Linfield College in Oregon. Taryn Sabia-Fritz ’01 (M. Arch. RISD) is a practicing architect and activist in Tampa, and co-founder and President of the Tampa Urban Charrette. Nick Schwartz ’98 owns and operates the Flynn Creek Pottery in Comptche, California. Garvin Sealy ’02 earned his MFA at the School for American Crafts at the Rochester Institute of Technology, and now works at the University of St. Andrews, Scotland, helping to develop collaborations and partnerships among the Arts, Humanities and Social Sciences. Ward Shelley ’72 is a sculptor and performance artist whose work has been exhibited in ten countries, is often featured in Art in America and Artforum, and is represented in the collections of the Museum of Modern Art and other major museums. In 2014 he was featured on CBS News as a result of his performance collaboration during which he lived in a very large hamster wheel for ten days. More recently his collaboration with Alex Schweder, titled ReActor, gained international attention. Lisa Sibley ’12 recently earned her MFA at Lesley University in Boston. She is a professional photographer, and has taught locally. Zack Sierke ’02 is a functional potter working out of his own studio with local clays in Fairhope, Alabama. Leslie Simons ’97 is owner and president of Simons Designs, working as art director, wardrobe stylist, and set and props designer, while also working in retail display and residential design. Steve Smith ’74 (MFA, University of Florida) has examples of his Artistamps included in the Moscow Artistamp Collection and the Gina Lotta Post Online Artistamp Museum. Michael Specht ’11 works for Apple in San Francisco, as a Camera Image Quality Engineer, most recently in helping develop the iPhone 7. He also continues to make his own photography. Melanie Taylor ’74 (M. Arch., Yale) in an architect in New Haven, Connecticut. She was one of the first architects to participate in building the planned community of Seaside, Florida, designing Rosewalk. Carrie Hall Tomberlin ’00 (MFA, Clemson) teaches photography at the University of North Carolina in Asheville. LIndsey Nahmias Turowski ’06 is a digital brand manager at Salve Regina University in Newport, Rhode Island. Mila Kollock Turtle ’90 is the owner of her own graphic design firm in St. Petersburg, Turtle Moon Graphics. Hallie Rae Ward ’12 is Business Manager & Art Director at the Art for the People Gallery in Austin, Texas, and regularly exhibits there. Jan Wiley ’78 is an artist in Tallahassee, and also serves as the Design & Communications Director of the Mission San Luis Living History Museum there. Tiffany Willey ’06 received her Masters in Science in Exhibit/Interior Design from Pratt Institute, and is now an exhibit designer for Gallagher and Associates, in the Washington D.C. area. Mary Yates ’91 earned her MA in Photography and Digital Media at the University of Louisville, and teaches photography for Spalding University and the Art Institute of Pittsburgh. Zara Yost ’12 earned her Masters of Arts in New Arts Journalism at the School of the Art Institute of Chicago, and she is now a freelance writer in Chicago. Gallery hours Mon. 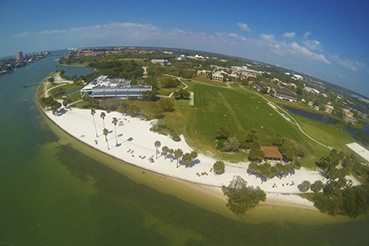 – Fri., 10 a.m. - 5 p.m.
Why Visual Arts at Eckerd?